Twitter is the number one Micro-Blogging Site and its very important for it to maintain its ranking as day by day competition keeps on rising & you never know when a site comes with better features. So Twitter needs to keep its users happy enough by introducing new features & letting them to gain something from it as it also aims at crossing the Social Networking Giant Facebook. It is also important from a users part to use the Social Media wisely to market their products,sites, etc & get some success from it. With Top Tweet one can easily get the exact & popular thing he/she is searching for on Twitter Search. 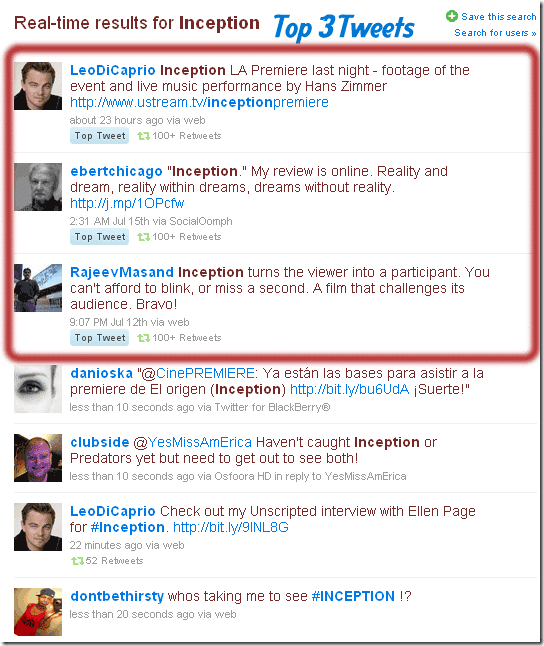 From the searches I did on Twitter; I found out that only Top 3 tweets are mentioned as Top Tweet(s). The Top Tweets are added once a tweet crosses 100 ReTweets. This acts as a filter for Top Tweets to give the searcher a clear and definite result for his search. So if you wish to be in the Top Tweet list, then Follow these tips to enhance your Social Media Experience. The logic behind Top Tweet(s) is simple, If the Tweet is present in Top Tweets then obviously it’s not fake, people like it & hence ReTweet it. 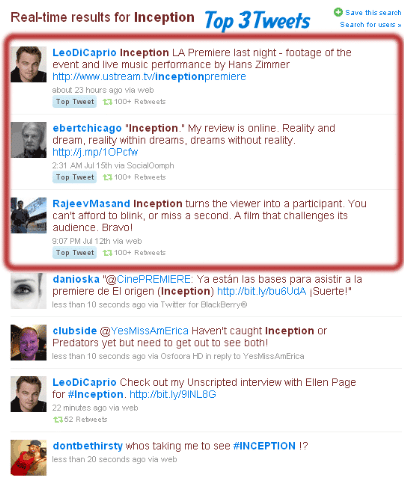 Take a look at the image below to get a know how a Top Tweet looks like for a Search on Inception, the latest Hollywood flick. Connect with me on Twitter if you liked the style of my writing @tospost. 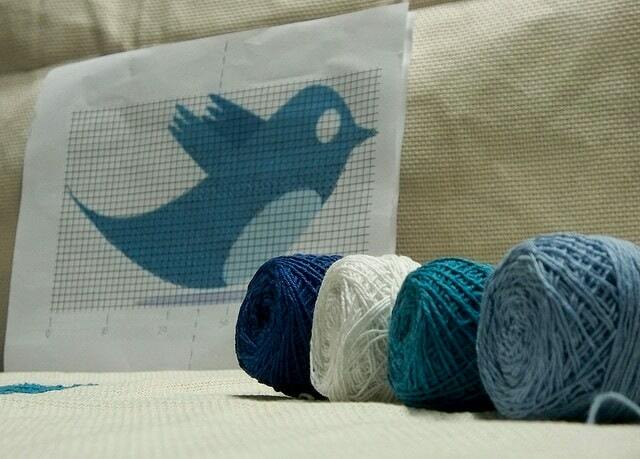 Do you have an opinion about this new addition to Twitter ? Share it with us in the form of comments. I’ve a lot from this post. Thank you for posting. I loved the new twitter. It’s awesome!